Yeah, I know, that’s not a real word. But seriously, this site IS a blast! 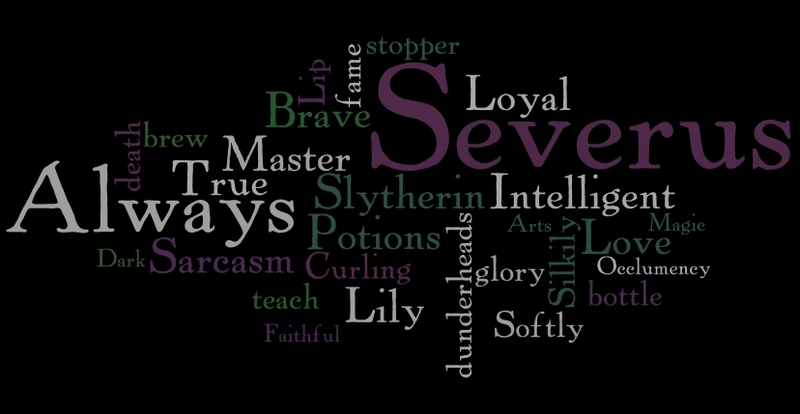 :D You simply most go have some fun at Wordle! Oooh, the fun one can have with this!! Check out my fave character… this one you can see the large size by clicking it (all the others will take you to the website). This entry was posted in Stuff and tagged Severus Snape. Bookmark the permalink. 3 Responses to How awesomely fun is THIS? I did that too for my blog and mypodcast page. :) It’s very fun!! Natalie, I love yours!! :D At least neither has a great big huge “working” in it like mine… ROFL!! That is so awesome!!! I need to make one too!